But for Aisholpan, the young Kazakh girl from the far reaches of the Altai plains, it was a choice. Bold and hardy, shaped by the harsh and bitterly cold Altai ranges of Mongolia, she makes the unusual step of being trained to become a successful Eagle Huntress. With the rigorous and whole-hearted support of her father and with the blessings of her Grandfather, she is able to make it to the top, and beyond. "It's not a choice, it's a calling that has to be in your blood"
The British-Mongolian-American documentary film, directed by Otto Bell includes a narration of events by Star Wars: The Force Awakens' Actress Daisy Ridley which also helped generate an interest in the movie owing to an expected screening of Star Wars: Rogue one at the Dubai Film Festival 2016, under whose tutelage The Eagle Huntress was being screened at Jumeirah Beach Dubai. 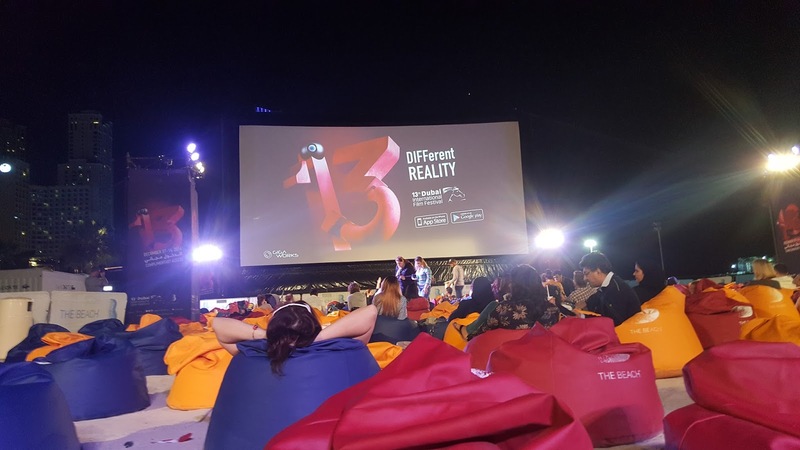 The free-for-all screening held at JBR Beach under the cold winter night of Dubai created a pleasant atmosphere to mimic the cold settings in the movie. The event was attended by multitudes of passersby who were accommodated in individual bean bags placed on the sands of the beach before a large temporary screen. The screen was complemented by strategically placed surround speaker system that delivered crisp and realistic audio. The movie scheduled for 7:45 P.M. started around 8:00 P.M once everyone was settled. The audience was handed out cards in which they were required to rate the movie once it was over to qualify it for the Emirates NBD People's Choice Award. The cute rosy-cheeked Aisholpan with her staggeringly adorable smile was one of the main reasons why most of the audience gave positive ratings for the film! The Screening Venue: The crowd gazes up at the screen from the comfort of their bean bags, arranged by DIFF. The movie begins with a lone Eagle hunter sacrificing a young lamb on a hilltop as he releases his eagle after 10 years of loyal service as per Kazakh tradition. "You have brought me only good. It's time to leave you free. Fly to the sky!" , he says. The film has breathtaking cinematography. The soaring camera gives a feel of what freedom and the open skies mean like from the Golden Eagle's perspective. The different camera perspectives are what make this documentary remarkably unique and artistic apart from little Aisholpan herself. Aisholpan comes from a family who have been eagle hunters for 12 generations. In Kazakh society, it is frowned upon for girls to take up the "masculine" role of an eagle hunter. Women are expected to milk cows, knead dough, make yoghurt, and look after other household chores. However Aisholpan's father Nurgaiv Rys supports his daughters choice. "Girls can do anything boys can if they try", he says. Nurgaiv Rys takes up the arduous task of training his daughter in the path of his forefathers. The film shows the nail biting scene whereby Aisholpan climbs up a steep cliff to capture her very own eaglet from a nest under her father's supervision. She is then trained to "rabbit run" her eagle, call it towards herself for food and finally train it from the mountain. "Even some men can't do that" , her dad remarks after an good training session. The film portrays other aspects of Aisholpan's life which are important to know where she gets her sturdy grit from. At an early age, she was made to stay in the school hostel, returning home only on weekends. Her mother remarks, that she never got to spend time with the her daughter as she was always out training with her dad. She knows how to ride a horse as well as cook food for the family. "I wrestled all the boys in the class and won" , she remarks with a smile on her return from school giving proof of her attraction to games of strength and virility. When his daughter is ready, Nurgaiv Rys takes her to her grandfather to seek his blessings. He gives her his blessings and names her eaglet "Ice Feet" on account of its rare white legs. One day, the radio announces the Annual Eagle Festival to be scheduled on the 2nd-3rd of October. Bukitshi (eagle hunters) from around the world were to compete at the festival. Little Aisholpan jumps to the occasion and tells her father "I want to compete." From then on, Aisholpan's never looks back. The Annual Eagle Festival is an important event that represents the tradition of the Altaic Khazaks and to honor their tribes. As the festival approaches, excitement builds all over the region. The film gives glimpses into Aisholpan's arduous training before the event. Both father and daughter leave home and set out on a long journey by horseback for the mountainside where the festival takes place. At the festival, people laugh and mock Aisholpan for being a girl and dabbling with the "game of men". Many of the elders openly refuse to recognize her. 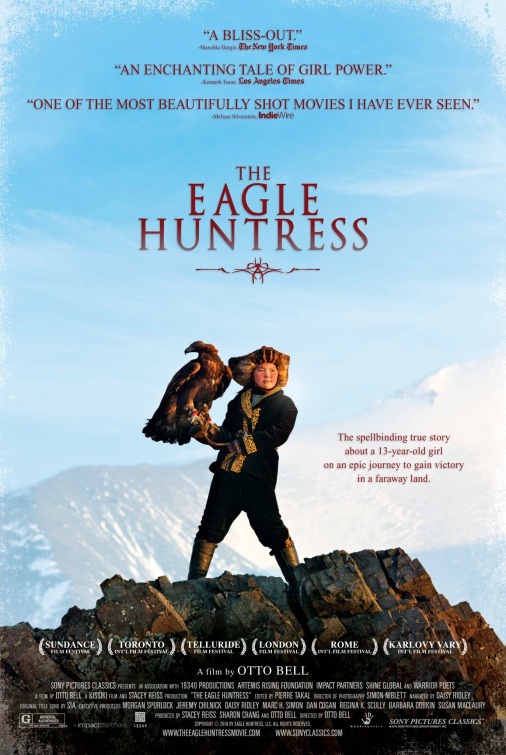 The documentary gives us their comical insight into the prospect of a female eagle huntress as well. Her father however stands by her side throughout and encourages her towards victory. The main event involves a beauty contest, chasing the fox and calling the eagle in a test for speed. Aisholpan excels in all to the surprize of the crowd, with a record score of 5s for her bird. When the final results were announced, amongst 70 contests, Aisholpan Won! Aisholpan had proven the impossible. She raised the respect for women amongst her people where she lived and brought accolades for her family. Yet her quest was not over. she must now travel with her father into the heartlands of the freezing cold and icy Alpine Mountain range where temperatures drop below -20 Degrees Celsius. And she must use Ice Feet to capture her very first fox to qualify as a True Eagle Huntress. The film was very heartwarming and brought tears of joy and applause from amongst the spectators at Aisholpan's stepping stones of victory. The film is a source of inspiration to people and women especially for whom anything is possible "if they try". Aisholpan, the star actress visited Dubai and the DIFF venue at Madinat Jumeirah alongside her family a couple of days prior to the screening. The documentary-film is set to release across theatres and media outlets and has already premiered at the 2016 Sundance Film Festival.